With the 202nd anniversary of the Battle of Trafalgar coming later this week, it’s a good time to have another look at one of the finest, large-scale modern maritime paintings. 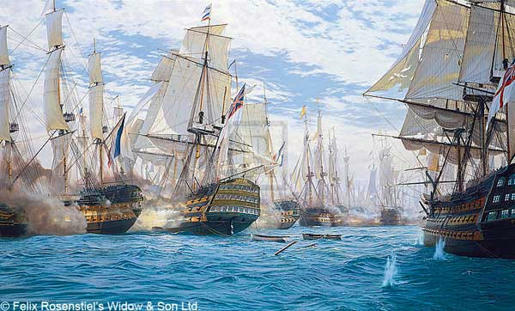 The picture is Steven Dews’ Battle of Trafalgar painted over 7 years with the aid of several maritime museum curators to be released in 2005 for the 200th anniversary of this momentous battle. The original oil painting made £95,000 at Bonham’s auction in their famoust London auction rooms. Since then, series of fabulous prints has been on sale and Artists Harbour is proud to say that we have been one of the most successful sellers of the large canvas print,1676mm x 1016mm(66-inches by 40-inches) which effectively from a distance of 1 metre gives you a £100,000 picture for around £1,000. We accompany the large print with three historic pictures that illuminate the wonderful Dews canvas. Read the rest of this entry »Artists Harbour Ltd.